It’s Gingham! So simple! So cheerful! A nostalgic pattern that will never go out of style. A classic! I had a pink and white gingham bed spread as a little girl. My dad and I went shopping for it together. I really liked the gingham but told my dad (at 5 years old) that I was too grown-up for pink. I think we both liked the lavender and white, but he really had no choice, since my mom had sent him to buy the pink and white since it was on sale. My favorite gingham colors are blue and white (like Dorthy’s dress in the Wizard of Oz) with close seconds of yellow and white or green and white. 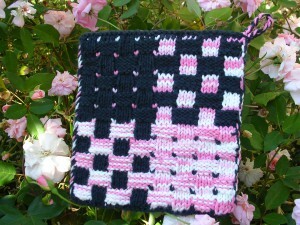 I choose to these colors to go as a 4th of July gift to the same girlfriend who I gave the Mimi cat potholder to. And because I was so excited about this pattern, I just wanted to knit a full sized ‘test’ pot holder up fast to see if my stitch ‘theories’ really worked. Other than 2 minor mistakes, it is a sweet design! I will be making this one again – for sure. I just love it. This potholder’s weave pattern was created out of dumb luck. I was making a test strip of stockinette stitch and reverse stockinette stitch, so I could recall and write down the steps needed to do the reverse stockinette stitch so I could fine tune the details for the grape holder pattern. 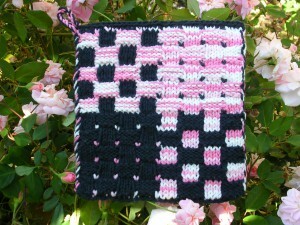 And as I was knitting a swatch the solid ‘basket weave’ effect evolved. I played with it some more and figured out I could make a weave of alternating color. 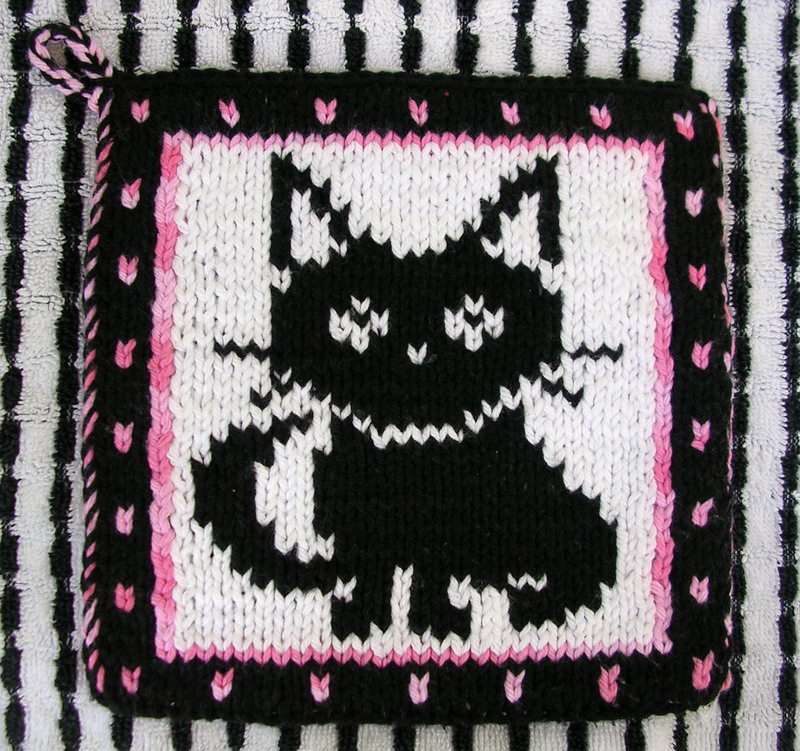 The rest was just laying out the stitch pattern in a chart that would make a nice square. 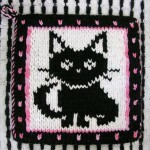 I love this pattern to knit. It is super fast to knit, since the reverse stockinette is a faster stitch and the pattern repeats, so less time is needed to study and count the chart as I knitted. Yarn: Both yarn colors are Lily Sugar ‘n Cream: Black and Strawberry. Total weight 50 grams or ~25 grams per color (1-7/8 oz total or ~1 oz per color).